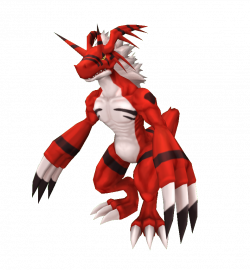 Growlmon X is an altered version of Growlmon that carries the X-Antibody Factor : Growlmon in its Digicore. Growlmon X is a Demon Dragon Digimon and carrier of the X Antibody, because it has accepted and contained the extraordinary power of the "Digital Hazard" within itself, and that its attack instinct as a Virus-species enhanced further, it will exhibit a ferocious nature where it is unable to control its overflowing power, changing its personality into one on a thin line with justice depending on how it grows up. However, Growmon's power has clearly increased, and the blades on both of its elbows have enlarged even more, developing and causing plasma to appear when attacking the enemy. Its Special Move is the destructive energy produced from the "Plasma Blades" on both of its elbows (Raiden Blade). Exhaust Flame. Fire attribute 11 seconds cooldown 162 DS consumed 3 skill points per upgrade Learned at Lv. Plasma Blade. Fire attribute 7 seconds cooldown 74 DS consumed 2 skill points per upgrade Learned at Lv. Charges blades on its arm with plasma and cuts the opponent. This page was last modified on 20 February 2019, at 00:09.